I hope your Sunday is as quiet and peaceful as mine has been so far! Looking at the past week, my major project was finally finishing an article on the interconnections, over a thirty or so year period, between Wolfgang Amadeus Mozart, the physician Franz Anton Mesmer (of “mesmerize” fame), Benjamin Franklin, and the musical instrument the glass harmonica. I had been putting together this blog post over the last several weeks, and had about eight segments that were independently pretty interesting. But organizing them into one coherent narrative proved to be, to put it mildly, a challenge. If you’re a writer, you know very well the kind of problem I was facing! A straight chronological scheme certainly wasn’t going to work, nor would separate segments on each of the four subjects, or any other logic-based arrangement I could think of. What I ended up doing was letting the histories of these four intertwine almost at random, which was more or less what had actually happened historically, the only criterion for my arrangement being that one segment of the story led more-or-less seamlessly to the next. Feel free, if the subject matter interests you, to check out the result and see if I succeeded in creating a coherent story. As for the coming week, I have a couple of posts in the works, including a review of Thomas Christensen’s 1616: The World in Motion, which I’m well into now and enjoying greatly. For fun I read the first of Henning Mankell’s Wallander novels, Faceless Killers – it was interesting to see how fully formed the Wallander character and the “feel” of the later novels already was at the beginning of the story. Now I’m also reading The Roads to Sata by Alan Booth, documenting his 2,000 mile walk from the northernmost part of Japan to the southernmost. Booth’s pleasingly gruff persona, amazing powers of observation, and deep sense of humor have made the book a treat so far. Knowing that Booth died prematurely – colon cancer took him at the age of 47 – I really regret the books that he didn’t live to write. One last note – among my most anticipated art exhibitions of the year is Out of Character: Decoding Chinese Calligraphy at one of my favorite places in the world, the Asian Art Museum in San Francisco. Opening on October 5 and continuing through January 13, 2013, the exhibition includes dozens of both ancient and modern works. While I’ve seen and appreciated examples of calligraphy from China and elsewhere, I’ve never been quite confident about knowing what I was looking at, or how to interpret it. I have a feeling this exhibition will be quite a revelation in this regard. The Museum has posted a slideshow of the installation process, which is quite interesting in its own right. From my old days helping out on installations as an employee of the Nevada Museum of Art, I know how hard and painstaking that process is. They do excellent work at the Asian Art Museum! 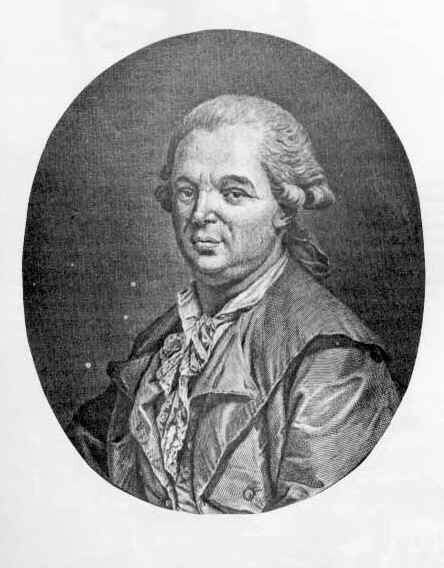 Initially interested in the effect of the sun, moon, and tides on the human body, Mesmer came to believe that there was a natural transfer of energy, or magnetic fluids, passing between all objects, living and inanimate, which he called “magnétisme animal” or animal magnetism. Using this as the basis of his practice, he set himself up as a physician in Vienna, and attracted many patients – and gained considerable notoriety, both positive and negative – through a treatment that involved the transference of this animal magnetism via touch and gesture, accompanied by incantations, light, and music. It was said that with this method, he treated “eye troubles, blindness, deafness, apoplexy, asthma, tumors of all kinds, skin and scalp diseases, migraine,” and even leprosy and gout. While there was strong feeling among many that he was a fraud, Mesmer had a host of loyal followers, including Marie Antoinette. The week past has actually been a productive one, although you wouldn’t know it by looking at my blog. Most of my writing time has been spent preparing program notes for the next concerts of the Reno Philharmonic Orchestra and my employer, the Reno Chamber Orchestra. These sorts of notes, if you haven’t seen them before, provide some biographical information about the people who wrote the music, and background, both historical and musical, about their compositions. With classical music not, unfortunately, being a common, integral part of our education anymore, giving listeners a little information before they hear these works at concerts might make their listening experience a little more fulfilling. That’s the hope, anyway. In doing research for these notes, I always happen on what I call “fun facts,” bits of history that aren’t necessarily important to the music, but might spur the imagination or curiosity of the reader, or just give them a laugh. For this last set of notes, for instance, I was reading about Franz Josef Haydn’s trips to London in 1791-2 and 1794-5, during which he wrote and premiered his twelve “London” Symphonies, Nos. 93-104, to an adoring public and sold-out houses. The most popular of these twelve at the time was the Symphony No. 100, the “Military,” which was the specific piece I was writing about and which became perhaps the most popular symphonic work in England for years after its 1794 first performance. Anyway, one of the “fun facts” that I came across was that Haydn received many, many gifts from his fans during these London trips. Among his favorites was a red parrot that talked, with a repertoire of words in both English and German. It pleases me somehow to know that the great Haydn owned a talking parrot. One thing I was not able to find in my research, however, was the parrot’s name. I shall not rest until I solve this mystery. Although I have no evidence at all to support this, I’m thinking that the parrot might have been called Bob. If I had a parrot, I’d name it Bob. Or perhaps Theophrastus*. Or Ziggy. Those program notes will be appearing at the Orchestras’ respective websites before very long. As far as my blog is concerned, my only entries this week pertained to the fourth annual Astronomy Photographer of the Year contest, sponsored by the Royal Observatory Greenwich. 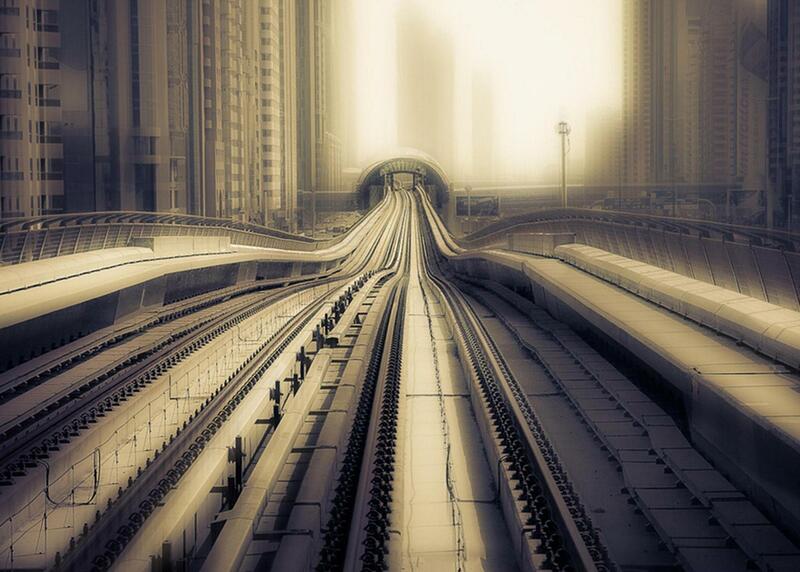 If you haven’t seen the winning photographs yet, you really should check them out. I put a few on the blog, and all the winners are now up at the Royal Observatory’s website. As for the coming week, I’m still working on Thomas Christensen’s book 1616: The World in Motion, and hope to have a review soon. A couple of other blog entries are in the works, but I’ve managed to distract myself a bit reading about the relationship, over many years, between Wolfgang Amadeus Mozart and Franz Anton Mesmer (of “mesmerism,” “mesmerize,” and “animal magnetism” fame). It’s an odd and interesting story that also involves a musical instrument, one of whose names is “hydrodaktulopsychicharmonica.” Be looking for that blog entry in the next few days. I must add a final shout-out to the 2012 National League West winning San Francisco Giants, who wrapped up the division win last night. Anchor Porter, my favorite beer, brewed of course in San Francisco, was part of the celebration. Until next Sunday, Go Giants! *Theophrastus, by the way, is in honor of the alchemist and physician Paracelsus (1490 or 1493-1541), whose birth name is one of the most sonorous of all time: Philippus Aureolus Theophrastus Bombastus von Hohenheim. Try fitting that on a driver’s license. As I mentioned a few days ago, this week saw the announcement of the winners of the Astronomy Photographer of the Year awards, sponsored by the Royal Observatory Greenwich, in association with Sky at Night Magazine. There were many, many spectacular entries in this competition. You can see the winners here. To encourage you to check out all the winning photographs, I’m not going to reproduce the overall winner. But here are a few more of my favorites from among the various winners. Click on the thumbnails to see larger images. The photo captions below are taken verbatim from the selected images. 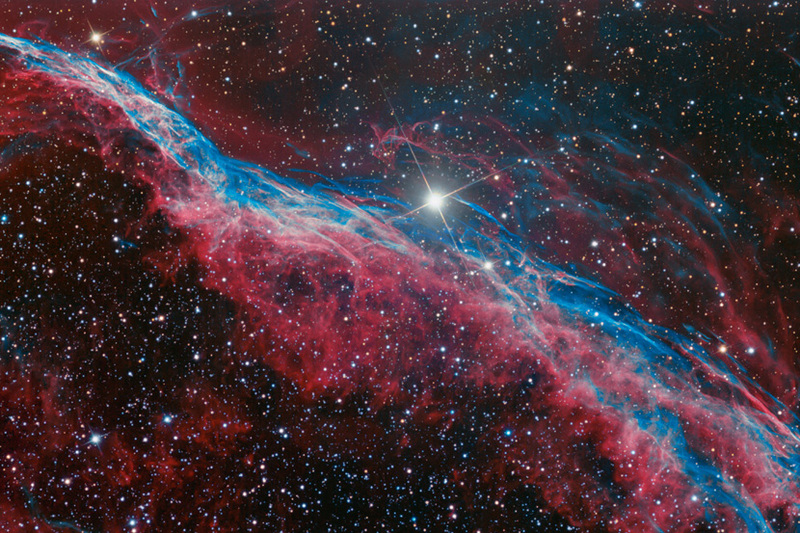 Above left – “NGC 6960 – The Witch’s Broom” by Robert Franke (Deep Space: Highly commended). Part of the Veil Nebula, the ‘Witch’s Broom’ is the glowing debris from a supernova explosion – the violent death of a massive star. Although the supernova occurred several thousand years ago, the gaseous debris is still expanding outwards, producing this vast cloud-like structure. In this image narrowband filters have been used to greatly increase detail while giving a reasonable representation of the nebula’s colour. 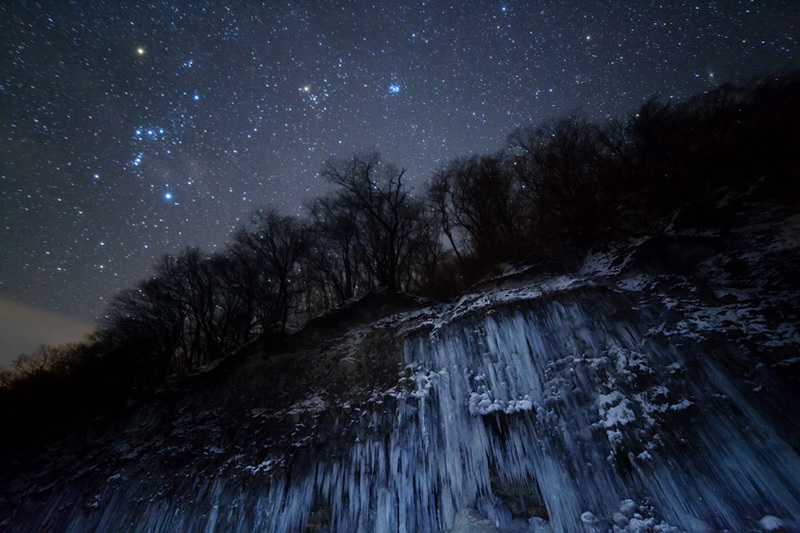 Above right – “Star Icefall” by Masahiro Miyasaka (Earth and Space: Winner). Taken in Nagano, Japan, this image shows Orion, Taurus and the Pleiades as the backdrop to an eerie frozen landscape. Though the stars appear to gleam with a cold, frosty light, bright blue stars like the Pleiades can be as hot as 30,000 degrees Celsius. 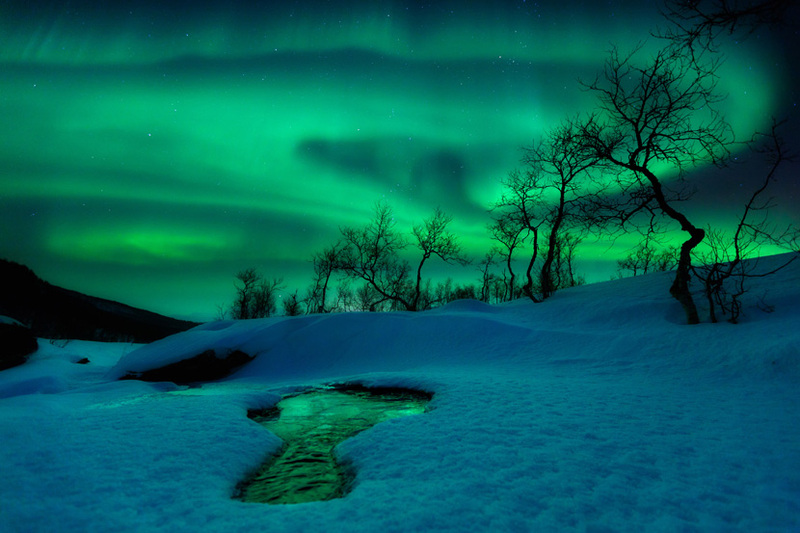 Above left – “Green World” by Arild Heitmann (Earth and Space: Runner up). The aurora borealis traces the shifting patterns of the Earth’s magnetic field, creating a spectacular midwinter show in Nordland Fylke, Norway. The green light in this image comes from oxygen atoms high in the atmosphere, which have been energised by subatomic particles from the Solar Wind. Above right – “Venus Transit” by Paul Haese (Our Solar System: Highly commended). 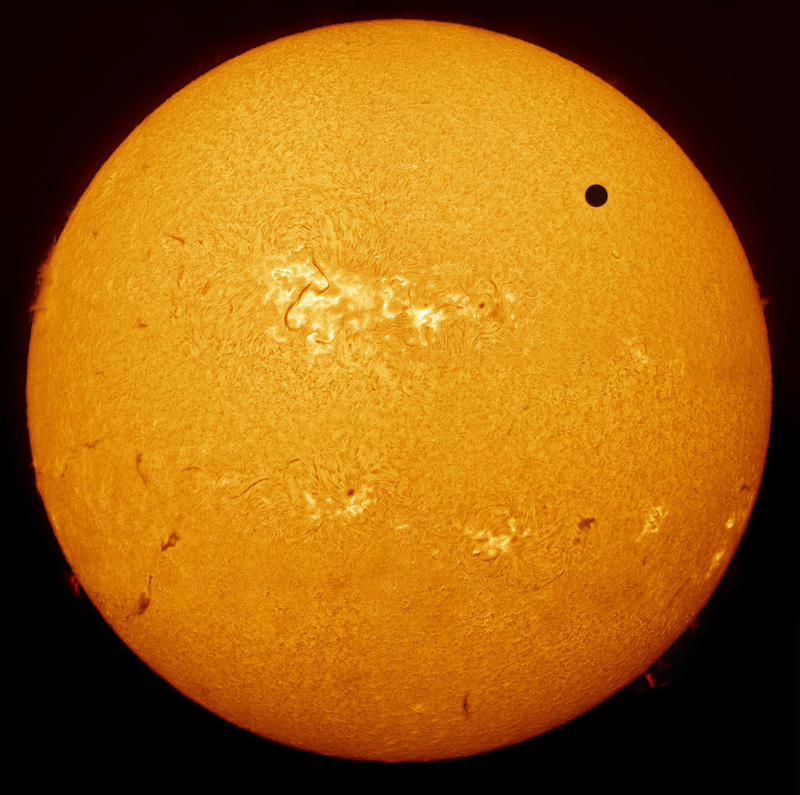 Perhaps the biggest astronomical event of 2012 was the transit of Venus, which took place in June. Transits occur when Venus passes directly between the Earth and the Sun, appearing as a small black disc passing across the face of our parent star. They occur in pairs, eight years apart, with each pair separated by over a century. The previous transit was in 2004 and the next will not be until December 2117. This is a spectacular view of the active Sun, streaked and blotched with filaments, sunspots and prominences. Venus, a world almost exactly the same size as the Earth, seems dwarfed by the scale and power of our local star. For the last three years the Royal Observatory Greenwich, in association with Sky at Night Magazine, has sponsored the Astronomy Photographer of the Year competition. 2012 saw a record number of entries from all over the world. With the results to be announced in just a few hours, it would be well worth your while to check out some of the really remarkable entries in the competition. You can see a few at the Guardian website, and others at this Flickr page. Past winners can be seen at the Royal Observatory Greenwich website. Below are a couple of my favorites. “Sky Away From The Lights” by Tunç Tezel. 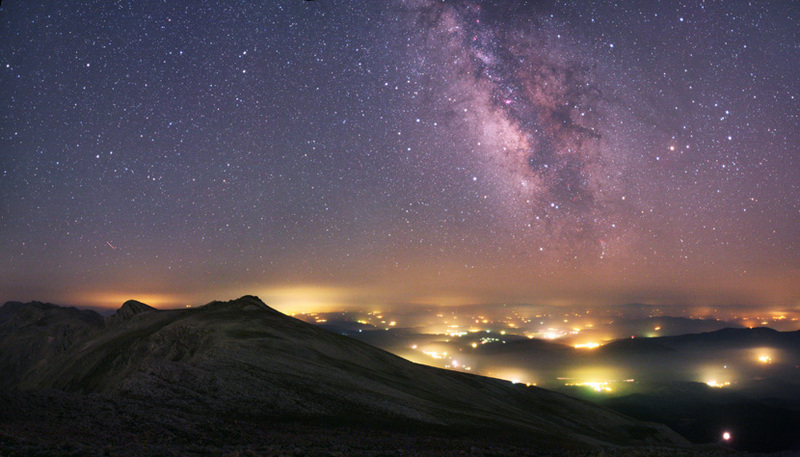 Taken at the Uludag National Park in Turkey, the photo shows the Milky Way hovering over lights from the various towns below. “Full Moon Setting Behind the Alps” by Stefano De Rosa. 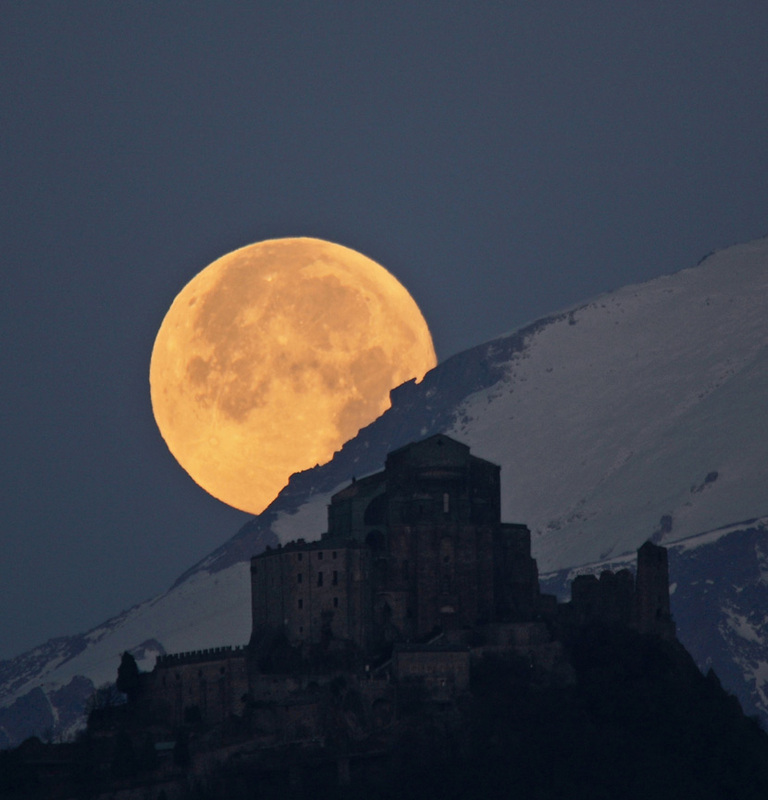 This picture shows the full Moon behind the Alps and the Sacra di San Michele, a religious complex on Mount Pirchiriano in northern Italy. This has been a hard week to do much blogging, although I did manage a few things. Much of my recent writing, however, resides on a hard drive that may have failed. While some of the files were saved in my last backup, a few may have gone to computer file heaven. I’ll know in a few days. The lesson: back up your computer today! Reading time has also been at a premium in the last week, although I’ve made some further headway in Thomas Christensen’s 1616: The World in Motion. And I’ve read the Kindle preview, and may have to invest in the entirety of, Sayings of the Buddha: New translations from the Pali Nikayas, translated and edited by Rupert Gethin, encompassing some of the earliest Buddhist writings in existence. The early part of this past week was spent preparing three podcasts for my employer, the Reno Chamber Orchestra, relating to its 2012-13 season-opening concerts, one of which was last night and the other this afternoon. You can check out the podcasts, and the program notes I wrote for the same concerts, here, although they may not have much interest unless you want particularly to find out about Kodály’s Dances of Galánta, the Second Symphony by Saint-Saëns, or Beethoven’s Violin Concerto. In a proper radio studio, recording and editing short podcasts would be a relative snap. In my spare bedroom, however, with little space, no sound insulation, and kids, cars, planes, and other noise sources outside my non-soundproofed window, it took rather more time than it should have. If you listen carefully to the podcasts, you can hear at least one car alarm and one shouting child in the background!